The humidity was thick enough to lick today here in Empire, Alabama. We walked early, but it was soon evident that we didn't walk early enough. 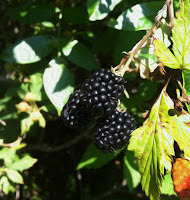 We did notice on our stroll as we huffed and puffed up the hill, that the blackberries are beginning to come in. When we got back to the house and hydrated, I got the blueberry basket and headed back down behind the barn. This is the first wave of berries. In the next few weeks, these bushes will weave their way through the underbrush and into the surrounding pine and sumac bushes. Novice blackberry pickers don't know to look more deeply into the thicket for the choice berries. They are not easy to find, and to get to them, one normally looks as if they've battled a bobcat protecting their young. But it's worth it. The berries are often as big as your thumb and sweet as tart honey. I got about a quart this morning and they were quite good. This evening, Jilda did her berry magic and whipped up a blackberry cobbler pie. We grilled fresh squash, cucumbers, onions, and corn on the cob. She'd baked a chicken for supper. We put on some classical music and ate in silence.......if you didn't count the grunts and the occasional "dang, this is good" comments. For desert, she cut us each a piece of the blackberry cobbler which was still warm from the oven. She put on a few scoops of Briars Vanilla ice cream, and instantly I was transported into southern heaven. It's not for wimps. You have to learn to deal with the humidity, but to me, the rewards are worth it. Yum! I love this time of year! The berries are so good and we love the humidity in Missouri! I hate the cold but 90 degrees and humid is perfect! Call me crazy. oh! That sounds soooo good! Lick the humidity? No, thank you. 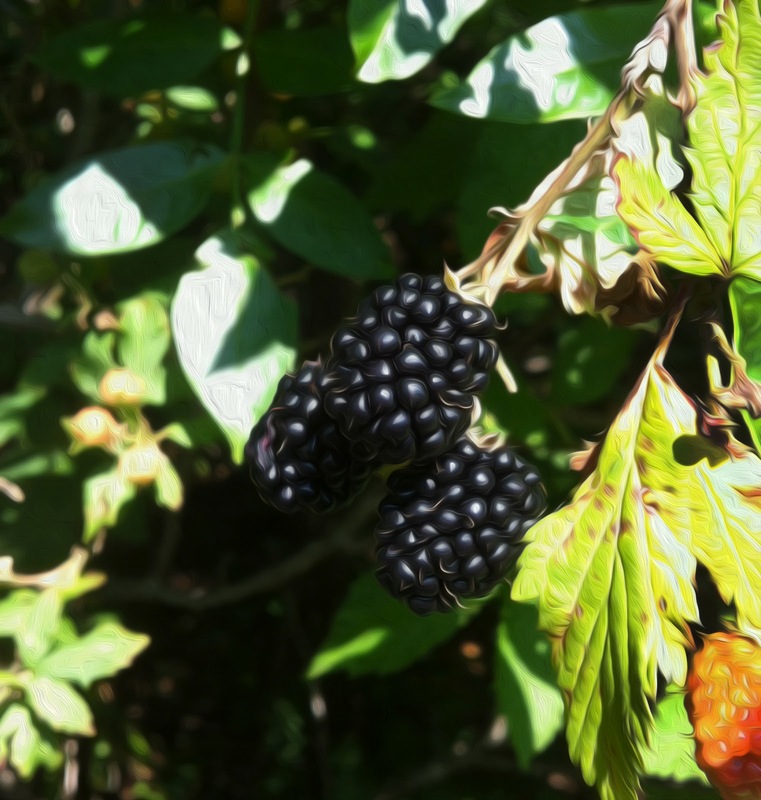 we have one wild blackberry plant that came up in a garden which we let grow. it's finally played out but we had fresh berries for a couple of weeks every morning. It does sound like heaven! Our berries will be along later than yours but they are just as hard to pick and taste just as good! The humidity here has been thick this weekend but next week we're back to 60's...that's Ohio for you! Enjoy your southern paradise!